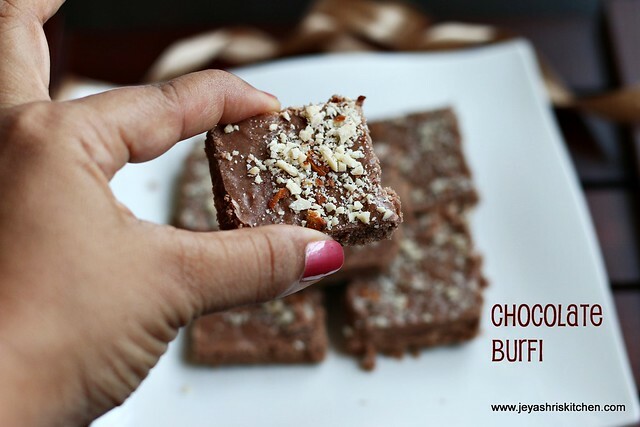 Chocolate Burfi or Chocolate fudge is a simple and easy to make sweet and trust me this will really be a treat for kids . 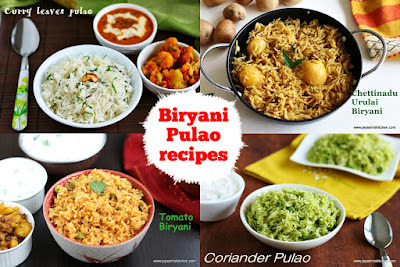 I learnt this from my husband’s mami , and i am sending this to my kids who have diwali celebrations at school tomorrow. 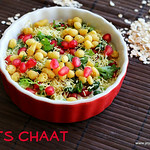 Try out this simple diwali sweet recipe. The important thing in getting the burfi perfect is the one string consistency. 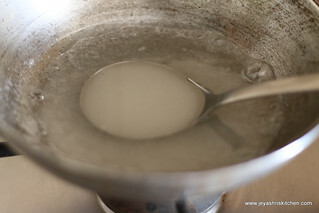 Take sugar in a saucepan and just add little water to cover the sugar. Boil this in a medium flame. 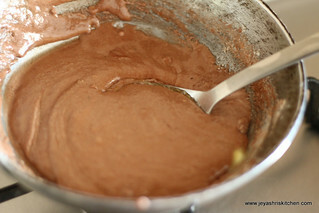 Just add the milk powder and cocoa powder mixture,butter to this and stir well. The consistency will be of a thick idli batter. In a butter greased plate transfer this mixture and flatten this. Sprinkle the nuts and desiccated coconuts to this evenly. When it is cool( may be in ten minutes) cut it into desired shapes and enjoy the burfi. This yielded 12-14 pieces of the size shown in the picture. I made this in two batches. So in the first batch i chopped the nuts with knife but during the second time i lost my patience and just put the nuts in the mixer and the difference you can see in the pictures. While making the second batch my husband suggested me to mix a portion of nuts in the batter(sugar syrup+milk powder+cocoa powder) and I spread a portion of nuts in the greased plate and garnished few on the top. I added 1/2 tsp of vanilla essence to the second batch of the burfi and it tasted awesome. 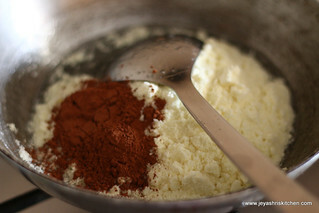 Do not cook in flame after adding the cocoa powder, will make the burfi bitter. Do not add more water to the sugar while making the syrup, this will make the burfi watery and cannot be made into pieces. Wish you and the family a very happy deepavali! Super quick and easy treat. I am sure the kids' friends loved the chocolaty burfis. Happy Diwali to all you n your family!! Wishing you a very happy Deepavali.. yummy sweet indeed. 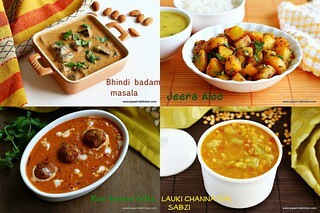 this looks so good and yummy...should try it soon..
these burfis look absolutely yum...beautiful clicks..
Looks so good!! would love to try this!! Happy diwali wishes dear, burfi looks simply inviting, prefect for me. Mouthwatering and yummy burfi....presentation is mind blowing. 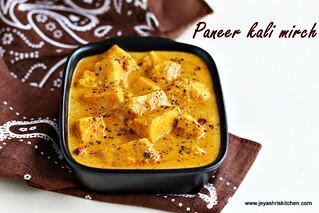 Looks fantastic Jeyashri. Beautiful clicks. A very happy Deepavali to you and your family. Glad to follow your blog! :) Do visit my space when you have time.. Wonderful Presentation and the burfi looks yumm. 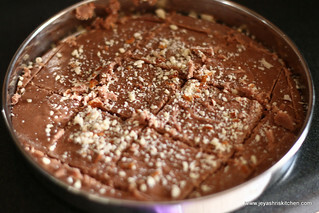 Yummy and delicious chocolate burfi, Happy Deepavali to u and ur family !! I love this burfi and I want to grab one from here. Thanks for the wishes and wish you the same!!! first time here. You have a nice recipe collection. Wish you a happy diwali! Impressive chocolate fudge. Wishing you and your family a very Happy Diwali. 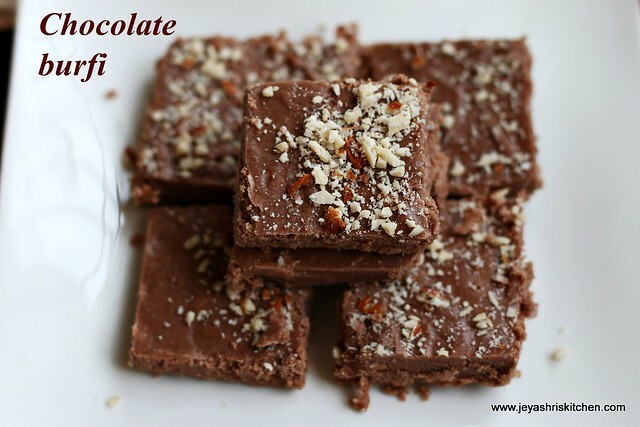 Fudgy n chocolaty ~ absolutely delectable treats! hi jeyashri...any substitute for milk powder?i mean can we use milk? 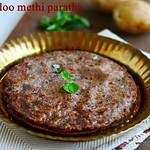 CAN U PLS GIVE A RECIPIE FOR MULLU MURUKKU WITH RAW RICE FLOUR, I CUDNT FIND IN URS. Thats great to hear, It always make us to feel good when kids love our cooking, right! 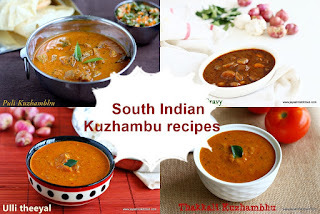 Reg the mullu murukku recipe, I have posted it already. I added raw rice, channa dal and yellow moong dal. what wud be the measure. 1 cup of rice yields 1 and 1/4 cup of rice flour, so adjust the proportion according to this. 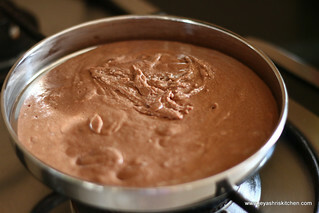 thk u. hi everybody pls do try this choclate cake it was a hit among my friends also . 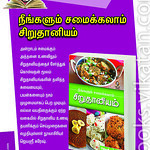 thks jshree, i will try mullu murukku also. thk u so much. advanced deepavali wishes to u and ur family. i have a doubt will it become hard after sometime?thanks for showing concern reagrding coconut burfi...thanks for the recipe. wishing u n ur family a very happy n prosperous diwali. Made this for Diwali and loved it !! It's very simple and quick to make. Also, it's different from the usual sweets. Any milk powder will use or preferably is there any. Hi - what is one string consistency? 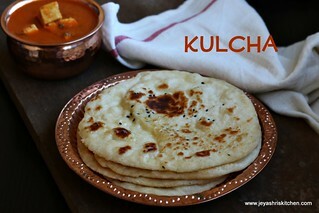 Hi dear i tried this yesterday.but didnt comeout well.after getting one string consistency i just switched it off and added other ingredients.but it turned out as a chappathi dough.so i have to add little hot water to make it bit flowing consistency.but aft pouring and cooling it didnt set at all.i just roll it like balls.it tasted good.if u tell me what went wrong i want to try and get it perfectly.hope u ll help. Thanksfor trying out. From your message i could able to make out that the mistake must be the water you have added after must be more. 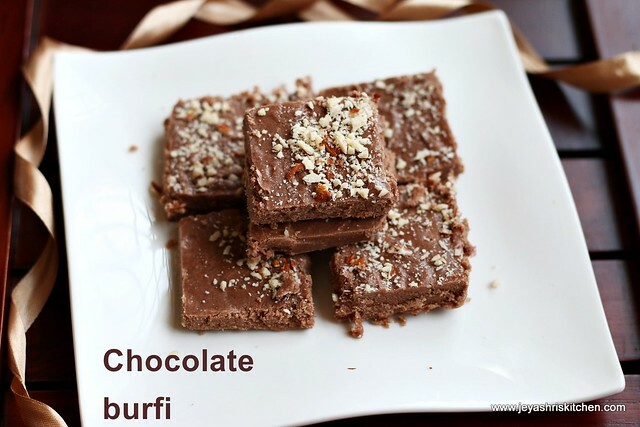 The burfi will set very quickly and i feel that even in the first time itself you would have stirred it for long time after adding the milk and cocoa powder. Thank u.i ll try once again and let u know.but the taste was just like chocalate.only shape is laddu and not burfi. Hi Jeyashri..could you please let us know the exact quantity of water to add? I think the trick lies in getting that right. Harini's problem also seems to be because of the quantity of water. 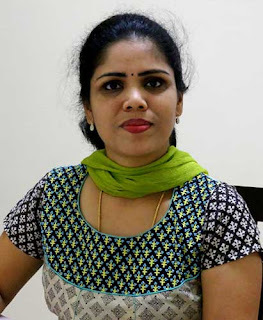 Deepa in general for sugar syrup we add very little water only. For this recipe 3 tblsp of water is enough. I tried this burfi and after adding coco and milk powder mixture in dissolved sugar it formed lumps and did not come like smooth consistency like yours..what should I do for this next time?